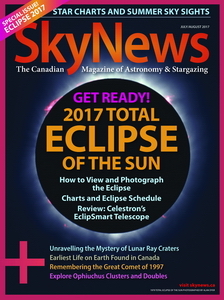 I was very excited to receive the July/August 2017 issue of SkyNews. It is chockablock with pieces on the August solar eclipse (occultation). It also includes a complimentary pair of solar eclipse glasses! Steven Fanutti has a image featured in the letters to the editor. Rhonda enjoyed the evening sky chart.